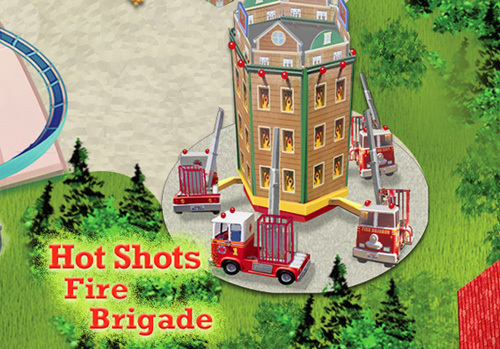 Younger children can drive the fire truck, while older ones aim to put out the blaze. This is a circular ride with two options: riding in the fire truck, or going up and down on the hydraulic lifts. If the wind is just right, you may get wet on this ride! This ride may not accommodate those of exceptional size. Toddlers may ride with a responsible companion of at least age 16 standing on the lifting platform, or may ride alone sitting inside the fire truck, and must be able to both walk steadily without assistance and maintain proper riding posture independently. MINIMUM HEIGHT 42″ TO RIDE ALONE STANDING ON THE LIFTING PLATFORM.